Piyush Jain got exposed to the world of cuisine at a young age and has worked with some of the top people of the hospitality industry. Since the very beginning, he had this inclination towards cooking food, and this kept growing. Besides creating culinary masterpieces throughout the nation, he enjoys spending time exploring food ideas of new restaurants in town and creating new dishes, which ultimately gave birth to Decode, as the name suggests. Owned by Piyush Jain and Shamit Ajmani, Decode Bar is located in Rajouri, Delhi and is now opened in Gurgaon as a part of the brand’s domestic expansion strategy. Brands and Branches is the master franchise of Decode and is responsible for the bar’s expansion. Piyush Jain, in an exclusive interview with The Restaurant Times talks in detail about his journey in the industry, the importance of strong operations, automating the process and a lot more. Decode is known for its experimental food, and the idea was to take up the favorite Indian street food and add a global twist to them so that modern Indians can have the taste of the world while sitting in a cozy corner. Decode aims at bringing innovation in food. Every item on the menu – food or drink, and even the interiors, have a specific idea behind that is left open to be analyzed by the customers. Jain further explains the concept of Decode with an example of an item on their menu that is Idli My Way. This particular item separates itself from the very basic steamed idli and chutney. Decode serves Idli in a baked style with coconut chutney foam and gunpowder gell. Food is our main USP as we are serving modern Indian food. Here, we cook the Indian dishes in an authentic form, but then, present them IN A western style. I believe people will always come back if the food is good and has a uniqueness to it, and I think that’s working for us. Also with a full bar, Decode aspires to provide an extensive drinks menu for patrons to accompany the grub. The location of any restaurant business will impact its success nearly as much as the menu. According to Jain, if a restaurant is located in the wrong place, it won’t allure the number of customers to stay in business. The same is true if the location is submerged around with competitors, or has poor visibility, or is hard to find. ‘It is important to know what the target market is, to find the right location for a restaurant. If the target market is families, then you won’t want a downtown business location. If the target is reaching out to foodies, then a small out of town location won’t work either. When the target audience is known then studying the demographics of the desired area becomes easy’, says Jain. Starting a business can be pricey and entirely arbitrary. According to Jain, break-even analysis helps in understanding if a company will begin to reclaim and recover those costs and begin making profits. Understanding the break-even point will help determine how much one needs in revenue to keep a business going. Additionally, a break-even analysis helps keep a check on the business, and it shows investors that one has a solid game plan. 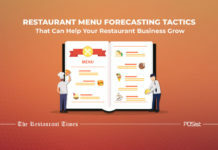 Sales forecasting and break-even analysis are necessary steps when starting a new restaurant because they give you an idea if you’re on the right track or if you need to adjust your numbers. Jain even proudly revealed that Decode reaching its break in just a month. More often than not, customers do not fill the feedback forms after dining as it is always considered an extra task that they find worthwhile doing only if they have something to criticize, or if the experience outranked their expectations. According to Jain, this is why most restaurants combat negative reviews even when a large percentage of their customers are happy with the dining experience but didn’t bother to leave reviews. When guests fill up the restaurant customer feedback form soon after they dine, you can urge them to leave reviews, or you can seek their permission to post the review straight from the tablet feedback system. At Decode, Jain adds, that as soon as a customer enters the restaurant, they have to give their contact information which is later used to take feedback on calls or as mails. According to Jain, food festivals always hold a vital position, and it is more about socializing and getting to know more people from the business, and like any other festivals, it will include the usual breakthrough activities. What makes such celebrations even more unique and exciting is that they provide equal convenience to the upcoming brands. ‘Food festivals are an excellent platform for the upcoming as well as the established restaurants to market their goods and display their best offerings to the humongous crowd,’ says Jain. ‘It is a great medium to conduct market research and tests for future ideas and dishes. Festivals are a sure shot way to gain some followers. Connecting to people, especially foreigners is the best way to generate word of mouth marketing. No marketing approach is better than word of mouth,’ he further adds. According to Jain, excellent staff is hard to find and even harder to retain in today’s competitive restaurant labor market, so making sure that the employees are happy as well as productive should always be a priority. Customers come to a restaurant just as much for the service you provide as the food you serve. If your employees are not motivated to perform at work, your customers will notice, and your monthly sales will shrink. ‘There are two things that every restaurant owner should consider to maintain the consistency and longevity of their staff, first, is to show appreciation for positive behavior and excellent customer service with an “Employee of the Month” recognition and incentives such as a small bonus, gift cards, paid time off or a prime parking space. Secondly, it is also essential to invest in training paying for classes that expand employees’ skills makes them feel appreciated and motivated to provide a higher level of service’, says Jain. According to Jain, the restaurant business is not all about opening a space and providing food, but it is about how it is maintained and formatted according to competition around. Frequent staff turnover or troublesome employee issues is one of the most discouraging and baffling aspects of managing a restaurant. It’s important to keep open communication with all staff on operational matters or concerns so that everyone from servers to chefs feel valued for their time and talent. Jain concludes by sharing about the success of his new venture; Decode in Gurgaon, and this particular outlet subtly incorporates World War II aesthetics in its interior. Upon entrance, one will notice the various memorabilia from the wars showcased on a shelf.